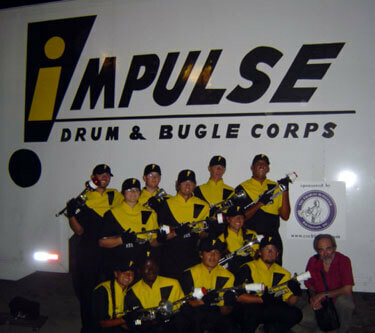 This picture is from Kyle Spraker a member of Impulse from 2001-2005. I marched with Impulse for four years (2001, 2002, 2004, 2005) where I was both soprano section leader and horn sergeant. I also just finished my third year at Long Beach State where I study trumpet with Rob Freer and will be studying with Jim Wilt of the L.A. Philharmonic next semester. This picture shows the 2005 Impulse soprano line with the principal trumpet player of the Boston Symphony Orchestra, Charlie Schlueter. Charlie taught our brass caption head and donated the mutes that were used during the show. I also had the opportunity to get a private lesson with Charlie. His teachings helped change some aspects of my playing that I had over looked and still continues to shape my musicianship. Not to mention this is just a really cool picture of the best section I ever marched with! Good luck with the 2006 season, I'm sure you'll hear me at the shows from the audience.